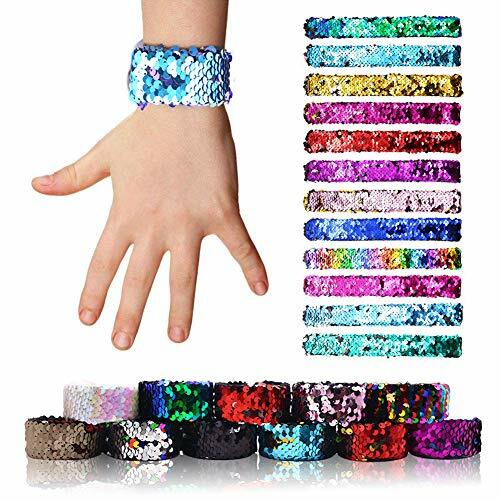 ❤UPGRADED Material: different from common bracelet, our slap bracelet is made of thickened metal,customized super soft velvet and high quality reversible sequins,which not shed and fall off easily,skin-friendly and safe for children. ❤Pretty Charming Colors Bracelets:package includes 24pcs 8.7\" x 1.2\" squin slaps,rainbow,gold,pink,purple,silver,etc,perfect for younger children,teens and adults,you can share with your friends and enjoy joyful family time. ❤MULTI-FUNCTIONS：mermaid slap bracelets can be used as birthday party supplies,goody bag fillers,class prizes,novelty toys,festival gifts,stylish sequin wristband and hairband. ❤Unique Gifts: slap bracelet is a great sensory toy and fashion gift for kids on special days and occasions such as birthday,Christmas,which is great for relieving anxiety and nervous feelings,improving concentration and focus. ❤Slap to Wear,One Size Fits All: With just a slap,it will instantly and easily go to surround your wrist.When you run fingers over the sequins,they flip to another color,suit for any colors outfits.